Commercial food service parts, commercial refrigeration parts, commercial appliance parts, coldstorage parts, walk-in cooler parts, walk-in freezer parts, refrigerator freezer parts, hotside oven and range parts, kitchen parts, cafeteria parts, catering parts, convenience store parts, supermarket parts, warehouse parts, deli parts, bakery parts and more. We stock frequently replaced parts in our online store such as: Door gasket seals, hinges, fan motors, wire shelves, custom made gaskets seals, Custom Wire Shelves, evaporator coils, compressors, timers, defrost controls, thermometers, heater wire, thresholds, lighting, pressure ports, infrared burners, H burners, tubular burners, axel fans, conveyor belts, grates, radiants, deflectors, solenoids, gas safety valves, pressure regulators, ignition modules, control boards, conveyor motors, heating elements, pilot assemblies, fryer baskets, fryer filter paper, Dishwasher parts, mixing accessories, grinding attachments, casters, legs and much more. In stock items usually ship same day if ordered before 3PM EST. 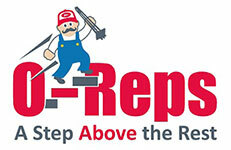 O-Reps, based in Washington and shipping from CA, WA, NV, MO, IL, IN, NJ, TX, FL. Allowing us to deliver your parts usually in 1 to 4 days ground shipping. We have in stock or access to a wide variety of commercial food-service parts, accessories and hardware. If you're having a tough time finding the part needed for your oven, range, char-broiler walk-in cooler or fridge tell us we'll do our best to find you your part. We are a veteran-owned and operated business founded in 2006 and incorporated under the name of CFEP, Inc. (Commercial Food-Service Equipment Parts) in March 2011. We stock in our store the most commonly replaced parts, from wire shelves to burners and much more. No marketing scams, we deliver the product you buy at fair but discounted prices, no hidden fees or last minute handling charges. Real people, Real service Real good prices. Please feel free to contact us if you have questions about our products, or if you are looking for something specific. Call us today at 888-289-5911 or email us at orders@o-reps.com. Distributor of Commercial Restaurant (Coldside) and (Hotside) Parts For: Walk-in coolers, Cold storage warehouses, Refrigerators, Freezers, Prep Tables, Ovens, Ranges, Steamers, Grills, Broilers, Coffee brewers, Food warmers, Cheese Melters and more! Alto shaam parts, American dish parts, American range parts, Anthony/Ardco door parts, Bakers parts, Bally parts, Berkel parts, Beverage air parts, Blodgett parts, Bus boy parts, Cecilware parts, Champion parts, Cleveland range parts, CMA dishmachine parts, Continental refrigeration parts, CTX Oven parts, Delfield parts, Duke mfg parts, Frymaster parts, Globe parts, Garland parts, Globe slicer parts, Hatco parts, Hobart, Holman parts, Ice-O-Matic parts, Imperial range parts, In-sink-erator parts, Intedge, Jackson parts, Kairak, Kason hardware, Kolpak parts, Lincoln oven parts, Magikitchn parts, Market forge parts, Merco savory parts, Middleby parts, Moyer diebel parts, Perlick parts, Pitco parts, prince castle parts, Randell parts, Rankin delux parts, Robot coupe parts, Salvajor parts, Silver king parts, Southbend parts, Toastmaster parts, Traulsen parts, True Mfg parts, Univex, Uniworld, U.S Range parts, Victory refrigeration parts, Vollrath parts, Vulcan hart parts, Waring parts, Waste king parts, Wells bloomfield parts, Wilbur curtis parts, Wolf range parts. We can get it! Just because you don't see what you need doesn't mean we don't supply it. Providing Restaurant equipment replacement parts to the Food Service, Hospitlity, Fast food, Health care Industries with online ordering 7 days a week!